Happy Opening Day – We love Baseball! Posted on Monday, April 4th, 2016, by Brenda Pottinger under Favorites. One of the many things that I love about Cincinnati is ushering in Spring with the opening day for baseball and the Reds! Fans line the streets for the parade, restaurants give out free food and just about everyone takes off for this fun “holiday.” Growing up outside of Louisville we didn’t have a major league team so my first time seeing the fans walking over from Newport was so much fun. People were out celebrating. It really is the best way to usher in Spring! Will you be going to the game? 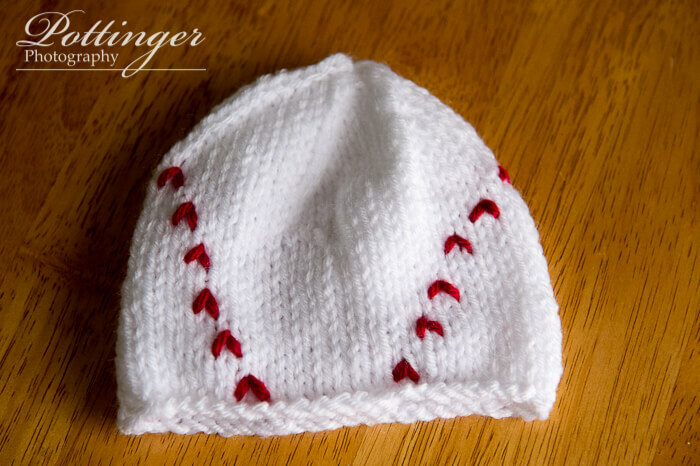 This is a newborn hat I knitted for our nephew. Happy Opening Day everyone!